Opinion Poll: Did Krrish Live Up To The Hype? Rakesh Roshan and his writers may borrow every comic book superhero film cliche available, but "Krrish" is a typical masala, Hindi film at heart - Unapologetic, flawed, preposterous, yet heartfelt, funny and immensely entertaining. Get plenty of popcorn and samosas, kick back, and enjoy. This one is for those who go to the movies for... time-pass. 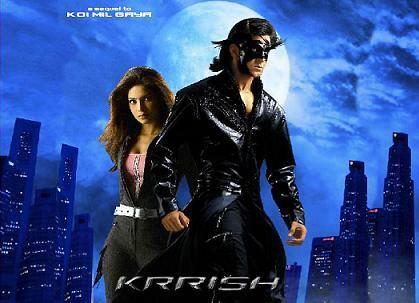 If you're unfamiliar with this term, "Krrish" is perhaps not for you. A sequel to the 2003 blockbuster "Koi Mil Gaya" , "Krrish" like its predecessor does not rely on spectacle alone to entertain, but rather on the simplicity of its story: the dream of a gifted young boy to break through the confines of an over-protective lifestyle, find love and make his place in the world. The innocent village boy's quest places him in extraordinary circumstances, forcing Krishna to become Krrish. While predictably blending crumbs from a plethora of Hollywood superhero flicks, Roshan's writers ensure that their hero is grounded in reality. As a result, we as an audience are prepared to willingly suspend all disbelief and go with the flow. The inspired writing clearly justifies the hero's transformation and appearance that is born out of necessity, as opposed to mindless gimmickry. Simultaneously, the film's core Indian traditional values in sentiment and storytelling style remain intact, springing unexpected but pleasant surprises, additionally working humorous and musical situations conveniently into the narrative. Paradoxically enough, Roshan allows for a recollection period within his narrative where we are transported back to "Koi Mil Gaya" as Krishna learns of Jadoo and his deceased father. The fact that the story of "Krrish" takes place 20 years after "KMG" but is still set in an environment that looks exactly the same is quite conveniently ignored. But since we're here to have a good time, let's not dwell on that too much. The Roshan's hard work is evident, for learning new techniques and implementing them without the budgets of their Hollywood counterparts is no easy task. The visual effects (extensive wire work & CG), though certainly not cutting-edge or flawless, are believable enough to sell Hrithik Roshan as a superhero. Equally impressive production design by Samir Chanda blends CG and available locations to create a highly convincing abode for the villainous Dr. Arya. Unfortunately, the same cannot be said about Amitabh Shukla's inconsistent editing or cinematographer Santosh Thundiyil's uninspiring, repetitive use of his jarring zoom lens. Again, let's not forget, we are here for time-pass. As Hrithik Roshan leaps from branch to building, saving children from a circus on fire, one could care less about such technical shortcomings. The man breathes life into a role that any other actor would have simply made a mockery out of. The seriousness and dedication with which he treats his character in itself is admirable. Ably supported by Rekha and Priyanka Chopra, Hrithik arrives with a bang as the definitive Indian superhero. Maninee Mishra and Sharat Saxena play pleasant cameos while the legendary Naseeruddin Shah hams his way through a stereotypical role as the evil, conniving scientist, Dr. Arya. "Krrish" does not attempt to be path-breaking cinema. It is a successful experiment at borrowing techniques that are usually used on a far larger scale and employing them to entertain the average, escapist Indian moviegoer. As his track-record at the box office proves, Rakesh Roshan has a very keen sense of what entertains Indian audiences best, and he serves up the same sentiments in an even larger than life package this time. Barring the fact that he can move at warp speed and wears a mask, Krrish is not too different from any other Hindi film hero we have seen before. Toofan, Ajooba, Mr. India, Shaktimaan, and Rajnikant can now welcome a new member into their club. The League of Extraordinary Indians anyone?